Contest of Champions is a beautiful and fun fighting game for iOS and Android devices. The game takes your through a series of missions where you must compete against bosses, such as Kang the Conquerer, for a purpose that I would deem too spoiler-y to add to a review. The Collector summons you in to control a group of heroes and villains of your choosing to fight against other heroes and villains to inevitably be declared the victor or the battle realm. Contest of Champions is based on the 80's Marvel series of the same name. Given that the story already exists, it seems to be looked over that somebody has in fact written and modernised the story they use in the game. Dan Humphries, writer of Legendary Star Lord, has sat down with Kabam (the developers) and written the fantastic story that you learn as you play through the game. As of now the game has 25 playable characters. I will include a link to their wiki page on each of the names, so if you need to do some research to learn more about each character, feel free to click their name to be taken to their bio. The characters are as follows: Abomination, Black Bolt, Black Panther, Captain America, Colossus, Cyclops, Deadpool, Drax the Destroyer, Gamora, Hawkeye, Hulk, Iron Fist, Iron Man, Juggernaut, Punisher, Rhino, Ronan, Scarlet Witch, Spider-Man, Starlord, Storm, Thor, Vision, Winter Soldier and Wolverine. The idea is that you collect crystals which allow you to unlock characters. You get several types of crystals. Daily rewards, premium currency purchases, multiplayer point purchases and rewards for completing missions. Some crystals unlock health/revives/energy, some unlock XP and some unlock champions. Champions have a great way of working together as you put them in teams. 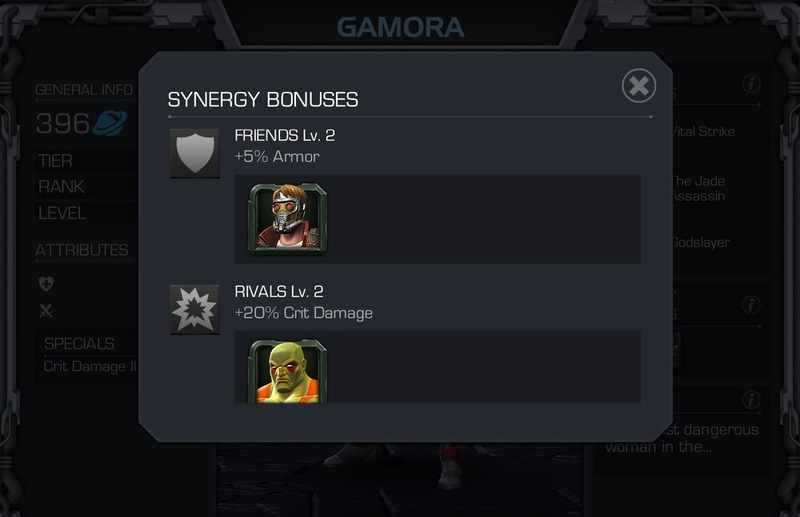 Synergy bonuses are used to give you an edge. For example, Gamora gets an added perk when teamed up with Starlord, based on their history in the comics. All the heroes have other heroes they work well with. If you assemble the perfect team, based on that alone, your team will stand a better chance of winning. You can rank up your champions in the game. As you win certain game types you will unlock base crystals and IOS-8, which is basically XP. Those two allow you to level up and rank up your heroes. As your hero reaches a certain level, they will cap at that point and you will need base crystals to rank them up so they can continue to level up and get stronger. Confusing in text, but makes sense as you play the game. You can also do daily strikes to help upgrade certain hero types. Along with hero levels are also stars. 1-4 stars are weakest to strongest, 4 stars being the top tier hero and extremely difficult to obtain. The most common is 2 stars, and 3 stars is rare. It is also unusual to obtain a 1 star hero after a certain point, but it can happen. There are 6 hero types throughout the game. Science, Mutant, Cosmic, Skill, Mystic and Tech. Each hero type is stronger and weaker against another hero type. This will give you advantages if you plan your team out correctly. You also have a choice to play "versus" which is usually PVP, but can sometimes also be events like 3 on 3. Playing versus is the only way to unlock the Punisher as a character. I was lucky enough to unlock him the day before writing this, which is good or I would of said it was impossible. Before unlocking him I had never even seen another player use him. However, as with cars, once you get one, you begin to see it everywhere. I still see people complaining that they could not unlock him, but it is indeed possible. Keep on hoping, true believers. As you play multiplayer you will gradually unlock battle chips. They are used to unlock exclusive crystals, which can then unlock the Punisher as a character for you. Each hero also has their own (somewhat) unique attacks. These are moves that build up as you fight and they can then be used at strategic times to help give you a leg up in a fight. They are little bars in the bottom corner that will fill up as the fight goes on. They go up slightly as you land a punch or a kick, and they go up a lot faster when the hits are done to you. Then will then allow you to launch a deadly sequence of attacks to drain the other players health. The stronger your hero is, the more powerful the attacks. Once you have 3 bars, it will begin a video sequence that will do an unbelievable amount of damage to your enemies. When you play the multiplayer modes you will begin against much weaker opponents and then as your win streak goes up, their difficulty goes up. Eventually you will fight people twice your strength. This process continues until your win streak is broken, and then it will start again. It becomes quite stressful, but it keeps things interesting. All in all it is a great game. I really enjoy it. It reminds me a lot of Mortal Kombat or Gods Among Us. I was always more of a Marvel fan than a DC fan, so this is a more fitting game for me, personally. I honestly can't put this game down. I really enjoy it. All in all, if you like fighters, Marvel, or both, then this is perfect for you. This is one of those games that I noticed MONTHS ago. There has been quite a bit of buzz around it. I first heard about it in PC Gamer a few issues ago, and then heard a little more about it on the Yogscast and generally just around the web. I didn't have to look far to find information about it, and the more I heard, the more excited I got. I'm going to try get this out of the way immediately, because I'll be decapitated by the Starbound community for re-vomiting the same information as every other company out there by saying this, but this game is hugely reminiscent of Terraria, and, to some extent, Minecraft. But, why does this have to be a bad thing? Those are two of the titles that I have spent the longest playing. Once I heard there were some FTL aspects drizzled on top, I was sold. It's important to point out that this is just a Beta version, and anything I judge based on this, I will have to re-judge once they game is officially released. Honestly, I'm just too excited to wait that long. This game needs to be played. Apex are ape-like creatures with naturally humanoid features. Due to a process that Apex researchers discovered, they are able to upgrade their intellectual state while degrading their physical state. There is much dissent among them, as individuals chosen for researching a better process never return. Avian are bird-like creatures without wings. They believe that their wings were lost upon entrance into the mortal world from the "Aether", or their "Plane of Gods". They believe that they will regain their wings upon entrance into the "Aether", which they believe is achieved only by complete theological devotion. Non-worshipers are called "The Grounded". Avian weaponry was gained when an unknown race bestowed it upon them. Floran are plant-like cannibal creatures. They have a peaceful appearance but are highly violent, engaging in wars with other factions of their race. They are exceptional at reverse engineering technology. It is not known if this capability has an effect on gameplay. Humans are ordinary Humans. Not much is known about this race at the moment. Hylotl are an aquatic species with fins on their heads. Not much is known about them at the moment, although from available depictions of the race the Hylotl culture appears to resemble that of feudal Japan. The Glitch are robotic creatures stuck in the Medieval Age. They reproduce by physically building their offspring. The Novakid are beings made out of solar energy. As the Novakids have little to no desire to record their history, little is known about their origins and any groundbreaking research is forgotten within a few generations. This race was added to the game when the pre-order campaign raised $500,000. I began my game in my ship, above a planet. I had very limited supplies, and I could do nothing but grab them and head to the nearest planet and begin excavating and exploring. You get several quests to start you off. Easy ones, at first, like hunt down some food and build a crafting table and furnace. *potential spoiler until end of paragraph* After a certain point you get a quest to build an expensive (extremely expensive for such an early game mission) distress beacon, which, for me, called in an enemy ship which absolutely PWNED me. The space station in Starbound is sprawling and full of potential. I have not figured out how to do a lot of this, so what can be done at this point in the Beta is still a mystery to me. Throughout your travels you'll find ways to upgrade and repair your ship, restoring it to its former glory. You'll need to find a crew, conduct research, catch rare creatures, and unlock its multitude of facilities. From a factory capable of producing mechs to labs where captured enemies can be studied and trained, the space station contains everything you need to explore the universe... except fuel. So far, the best fuel I have found is coal. I mine it, dump it on the ship, and mine some more. Typically you need 250 fuel to go anywhere interesting, in my game, but that's fine. I would suggest you avoid Ice and Snow as you will just freeze to death. An interesting point to this game is that you can freeze to death at night, or on colder planets. You can warm yourself up with enough torches, or a camp fire, or even a furnace. You can also starve, so you should really find food. Right now, there are two easy ways to make food. (1.) Grow crops and (2.) hunt with your bow and arrow and hope monsters drop meat. You can only get monsters to drop alien meat by killing them with the bow and arrow. You can get a huge selection of tools an weapons. You have your typical swords and pickaxes, but you can also get more throughout the game, like guns and explosives. You can upgrade your old tools by encasing them in a slightly harder materiel. You will always require the downgrade to upgrade. If, for example, you wanted to upgrade your bronze armour to iron, you would need to have the bronze in the inventory, then upgrade it with the anvil. It means you can't just skip steps, you really need to earn your gear. I have encountered different races in the game, as well as monsters. Sometimes I stumble across homes that these other races have built on the planet. I have yet to meet another human, but they're probably out there, somewhere. I have encountered a giant Apex prison. I made the mistake of going in guns blazing, and underestimated how big it was. I got absolutely decimated. You can just go in unarmed and everything is fine, but I just didn't give up trying 3 or 4 times until I thought I'd give peace a chance. It worked. I then robbed everything they owned, to get revenge. They didn't seem to mind, but they are just gun wielding apes. There is a lot more to discover. Once the game is ready to launch, I will do a full updated review, but I just figured that this game is so good, it needed to be recognised. I haven't found any bugs, yet. Well, not glitches, anyway. Plenty of space bugs, though. This game is certainly worth picking up. You can get it here, and you totally should. If this review helped you decide in any way, please let me know in the comments. The story behind Sir Hammerlock’s Big Game Hunt starts off by the player taking a trip with Sir Hammerlock to hunt down some of the biggest and baddest creatures on the planet. Things goes somewhat wrong thanks to a Hyperion scientist by the name of Professor Nakayama. Probably the most needy of all villains. However, his dialogue is hilarious. Nakayama is obsessed with Handsome Jack, and his plan is to clone him and bring back the reign of evil he wanted to bring upon Pandora. It's unfortunate that the main quest is over before it really begins, I thought Dr. N had a goofy charm and was hoping to face increasingly ridiculous bosses. On the plus side, however, is that there are few extra side quests to occupy your time, but considering how much this DLC would cost without the season pass, I'm left to ask the question "is this really worth it?". Though you can access Big Game Hunt at any time with fast-travel posts, it’s much much smarter to save it for when you’re either suitably leveled up, level 30 is a good start. The setup for Big Game Hunt is absolutely with opportunity. Sir Hammerlock has invited you out to his cabin in Aegrus for a quiet weekend of hunting and boisterous humour. The new area called Aegrus is very African Leading the way of the new bandits and psychos wearing tribal masks and throwing tridents, the humanoid Witch Doctors are a huge threat as they can both heal and instantly level up party members. This makes gameplay incredibly difficult when you're being outnumbered, as the enemy is healing quickly and coming at you quite fast. Aside from their support capabilities, Witch Doctors are also capable of turning into elemental tornado if players get too close, surrounding them in a whirlwind of fire, acid, or even vampire bats that can cause confusion and panic along with a trigger happy, ammunition eating, response. Another enemy that will cause you difficulty is the Drifter, an enemy that fans of the Borderlands 1 DLC will remember. These tall 4 legged creatures are an absolute pain if you're not a high enough level. Fortunately, that's not all of the threat that Aegrus has to offer. There is the completely new scorpion-influenced scaylions which can come at you in any size, and the boroks who can stomp the ground and cause considerable damage. The most threatening and formidable are the silent but deadly Giant Spores. These elemental balloons float high above players, approaching at the worst possible opportunities to make their move. They often fire smaller spores at you, each one has limited health but can do a lot of damage if they land an attack. When the giant spore is destroyed it will split into smaller spores, often distracting you from imminent threats around you. It’s difficult to recommend Sir Hammerlock’s Big Game Hunt for gamers who aren’t receiving the DLC as part of their already purchased Season Pass, as the content feels like it is missing something in its overall presentation and execution. No level cap increase, no increased storage, and only a few of new non-legendary guns are hardly selling points. Sir Hammerlock’s Big Game Hunt is not the best Borderlands 2 DLC I have played, but I did enjoy it. If you're a diehard fan, you've already gotten this DLC. If you're unsure about spending the 800 points this will set you back, then this DLC is not for you. This DLC is really just aimed at the people who adore this game. True Skate is a skateboard app with unbelievable control and physics. The game is an insanely realistic designed skateboard simulation. I've never played anything quite like it before, to be perfectly honest. You swipe your finger on the ground to skate, and control the board by swiping along the deck. A downward swipe along the board sends you airborne, while left and right swipes on either the center or tail of the board, will control your kickflip or pop shove-it. Combining tricks and grinds racks up points that map to a few in-game achievements. There are missions to perform certain tricks or to “follow the leader” along a path or series of tricks. But after these basic tasks it gets a little boring and repetitive. It can be tricky, and will take some practice before things start to work the way you expect, but eventually they do and you'll be surprised with how many different tricks are possible by combining the various flips and grinds in the game. Now, True Skate does a better job than any other iOS game that I've played at making you believe you're really in charge of something, but the flaws in the game are so damn frustrating. The fact that there is only one small skate park you can use makes it very repetitive, alongside repetitive missions. It gets a little bit boring. The little things like the rewind button activating when you don't mean it to and the board not quite reacting the way you want it to can get really frustrating, too. They have since fixed the rewind issue, to their credit. The jump swipes also occasionally fail to register. The physics and tricks in True Skate seem a lot more realistic than in other skating games I have played in the past. They're solid and genuine. However, missions can be so insanely frustrating. You get punished so much for straying off the path even a little bit, and following the ghost board just is not easy as it is. You turn a little off the track and suddenly you're down 75 out of your 100 points. Tricks are fun when you’re letting loose and going crazy in the park, But not when you need a specific trick to land you facing exactly forward. I had the advantage of skating for most of my teen years, so it was actually almost like a friendly reminder of my past when I got to play this. It reminds me that skating is not easy, and that you actually have to work to improve. Like in real life, when you practice it will get easier. The more you play True Skate, the more you can notice yourself improve. There are a few things I would like to see change in the future. There's just the one skate park in True Skate. It's a great park, with a great design and mix of different obstacles to hit, but it's just boring after a few hours of on and off playing. I'd really like some sort of board customization, as you're currently limited to just the generic True Skate board. I'd love to import my own board, or even just pick some from a selection of board skins or something. More boards with different attributes or even an upgrade system could really be a fantastic way to keep people interested for longer. Overall the game is actually quite good. They physics are perfect, they really nailed it. But there is a huge lack of variety and there is just no real reason to keep playing after a while. If they fix this, maybe I'll redo my review in the future. All I can say now is that if you have ever touched a skateboard or even played a skating game, this is worth getting just purely because of the physics and fun of learning to control your board. However, if you're easily frustrated or bored then this game is just not for you.